This article doesn’t really have a place on this site anymore, but it’s something every millennial should read and think about. Hopefully this will catch widespread attention like the recent address to those intelligent millennial Bernie Sanders supporters did. What do I mean by “priced out”? A recent US News report points out that homeownership for millennials 35 and under has declined to historic lows. The report points to many causes for this historic decline: tightened mortgage standards due to new mortgage rules, young adults still saddled with student loan debt, a poor labor market and poor credit. To look at other factors as to why people in their late 20s and mid 30s aren’t in the market for home ownership, we can look at the Home Price Index over the past 25 years courtesy of The Economist. The HPI is a measure of single-family house prices, serving as an accurate indicator of price trends at various geographic levels. The comprehensive HPI report is calculated quarterly. To see the most recent report from October 2015, click here. Here is a graph of the Home Price Index for New York, Los Angeles, Chicago, San Francisco and Boston; five major U.S. cities millennials are ever so eager to live in. As this graph points out, home prices on average in the U.S. have appreciated by nearly 20% during the three years following the housing crash. Which is great… if you already owned a home. As the FHFA reports, home prices were up 6.1% from October 2014 to October 2015. These two graphs are wonderful for Gen Xers and Baby boomers who own homes or rent homes out to working families and college students. Unfortunately for millennials who don’t own homes, we’ve been priced out of the market given current appreciation levels mixed in with stagnant wages and the burden of college loan debt haunting so many. Simply put, investors can (and do) outbid young couples in the market for their first home for the opportunity to score big rental income from college students in dire need of housing. Newsweek recently reported a few months back that by 2025, nearly 15 million U.S. households can expect to devote more than half of their income to rent — up from the 11.8 million households in 2015 that already do. This graph from Harvard’s Joint Center on Housing Studies shows how low-cost rental properties are vanishing from the market and being replaced by newer and more expensive units. How are millennials supposed to save for a down payment on a home if over 50% of their monthly income is going towards rent? They can’t. Yet for some reason millennials will still do anything for the opportunity to rent in New York City, Los Angeles, or San Francisco. The S&P 500 has gone up 177.2% (more than doubled) since March of 2009 when stocks hit rock bottom after the financial crisis. Similarly, the Dow has risen over 150% (more than doubled) during that same time. According to data collected by Motley Fool last month, 74% of millennials are NOT invested in the stock market. Reason being? 53% of the 74% who are not invested in the stock market admit that they lack the necessary funds. Always right liberal college students love to use this artificially inflated stock market as an argument when they create their side-by-side bullet point pictures to share on Facebook comparing the state that the country was in at President Bush’s exit to what Obama has accomplished during his first 4-6 years in office. One bullet point that always seems to “make the cut” is this idea that the stock market doubled under Obama’s presidency. Yes, the stock market did double under the Obama presidency, thanks to the Federal Reserve’s bond-buying program which essentially injected a $3 trillion dollar stimulus into the stock market to pump it up. Again, this market surge is great for those Gen Xers and Baby boomers who kept their money in the stock market, but liberal college students seem to think that they somehow benefit from this artificially inflated stock market. Little do they know, it’s now TWICE as hard for them to get IN the stock market than it would have been in March of 2009. But hooray for President Obama. Not much more to say about this, other than sorry millennials… you missed the ride. The ever-rising cost of a college education – every politicians favorite talking point. 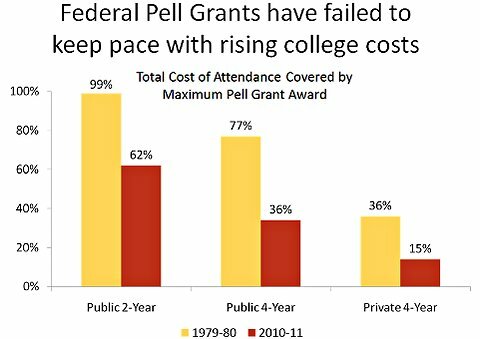 To put into perspective just how out of reach the cost attending university has become for low-income and middle class students and families, lets look closely at how the Federal Pell Grant Program has changed over the years. Keep in mind that the Federal Pell Grant was originally designed to be the foundational grant for low-income and middle class families so that they could send their children off to college without getting buried in debt. The maximum amount awarded for the Federal Pell Grant in the 2015-2016 academic year was $5,775. This is up a measly $45 from the $5,730 offered for the 2014-2015 academic year, and $130 from the $5,645 offered for the 2013-2014 academic year. Clearly, something seems off. Could it be that the budgeting for the Federal Pell Grant Program is out of touch with how much tuition has been rising in recent years? Lets look at two schools, one big public four-year college, and one big private four-year university. Arizona State University is a public research university with a total undergraduate enrollment of 39,968 students for the 2015-2016 academic year. According to a Collegeboard report, tuition at ASU over a five-year span from 2008-2009 to 2013-2014 has increased by 70% ($4,135). Boston University is a private research university with a total undergraduate enrollment of 18,017 for the 2015-2016 academic year. According to Boston University’s official website, tuition alone (not the total cost of attendance) for the 2015-2016 school year is $47,422. This is up $8,108 from the $39,314 tuition for the 2010-2011 academic year. I think it’s safe to say, the Pell Grant is no longer the relief it once was for low-income and working middle class families. As if that wasn’t bad enough, Senate Republicans just recently passed a budget that aims to gut funding for the Federal Pell Grant Program through eliminating guaranteed funding, and leaving it up to Congress’ discretion to fund the program. To reiterate what the Washington Post and Center on Budget and Policy Priorities have stated on this matter, the Federal Pell Grant provides much needed assistance to nine million plus of the nation’s most financially in need college students. But lets talk about the 2016 Oscars. It’s a fair argument to make that young adults’ consumption habits are greatly influenced by economic forces (like income). USA Today recently reported that the average price of a new car as of May 2015 is now $33,560, up 2.6% from March of 2015 and up from $29,217 in 201o. Sure, Uber and Lyft are cheap and convenient ways to get you to-and-from the airport and home from that house party, but is it really feasible to call Uber when your family needs to get back from a full course shopping at the grocery store? Absolutely not. Valid point. However, there comes a point in your early to mid 30’s when you’re tired of driving around someone else’s hand-me-down car with 60,000 miles on it and just want the piece of mind of owning a new one with no miles and a manufacturers warranty. The American Dream. You gotta be asleep to believe it.